Using this guide to translate your guitar knowledge into ukulele knowledge will require a very basic understanding of music theory, but even that may not be necessary if you’re willing to fiddle around and know how to count. This one should go without saying, but a little crash course in guitar chords couldn’t hurt for those who are just beginning. We’ll get into the more sophisticated chords in the form of a basic transposition, but the odds are you’ll be able to get by with just a few of the essential chords. A lot of pop songs are comprised of just four chords, and those chords are usually taken from the major and minor scales. These chords are relatively easy to learn and don’t require you to move your hand up and down the neck all that much. We’ll cover A,D,G,C, and E. You can really play nearly any popular song on the radio with a combination of these chords. The standard tuning of a guitar goes as follows: E, A, D, G, B, A. This tuning is what you will typically find on any guitar laying around anywhere. This is how people learn their basic chords and scales, and is also what most musicians use when they play professionally. While the ukulele only has four strings, the way that that the strings are arranged has a similarity to that of the guitar. The guitar utilizes a wider range of strings to create a fuller and more expressive sound. The ukulele, while a bit more stripped down than the guitar, can still create the same chords and scales. The ukulele seems a little complicated to guitar players for a couple of reasons. First, it appears to be tuned differently than a guitar, or, at least the strings are tuned to different notes. Second, the top string is a lot thinner and higher than the second string, making the arrangement a little more complicated. This top string operates in the same kind of manner as the top string on a banjo, and is nothing to be afraid of! The tuning of a ukulele goes as follows: G, C, E, A. The thing about this tuning is that it is set up in the same intervals as the for highest strings on the guitar. When we think of chords on the guitar we typically imagine that the foundation lies on the lowest notes. While this is true of the guitar, you need to adjust this idea to translate them into the ukulele. The same chord shapes that are found on the four highest strings can be found in the same formation on the ukulele. They are simply transposed up a fourth. This is that basic music theory that would be handy to have known before. Luckily, it’s pretty simple and not too difficult to describe. When you’re counting up to four on the fretboard, you can think of each letter as one step. While you’re just starting out, it would help to understand the major scale, as all of the dominant notes are found on it. If you’re looking to get more complicated with the ukulele you will need to know sharps and flats, but a simple understanding should do for now. So, the chord shape that’s found on the top four strings of the guitar is the same as you would use on the ukulele. The only difference is that you would move that shape up one fourth. The same chord shapes create the same chords only if they are moved up a fourth on the fretboard. So, if you’re willing to shift your hand up the neck of the ukulele and to transpositions in your mind, you’ve got all the chords down pat. While you may be able to do those calculations in your head on the guitar, you probably don’t want to memorize all of those notes again. When someone strums a ukulele, they want to play chords that rest near the bottom of the fretboard, coming with an effortless move of a couple of fingers. The tricky part about getting this down on the ukulele is that the same chord shapes are used, but they create different chords. You’re probably thinking, “You liar! I got this far thinking all the chords would be the same!” The chords are the same, but only when transposed up a fourth. The chord shapes on the base of the neck will create the chord that is one fourth up from the original chord shape on the guitar. Now let’s go over some of the chords and how to play them on both instruments. The A chord is possibly the simplest to play on the guitar, requiring you to pace three fingers on three consecutive strings on the same fret. Place a finger on the second fret of the D,G, and B strings, strumming those strings in addition to the A. That is your basic A chord and will be useful to you throughout your musical career. Because A is a fourth down from G, the A chord formation on a guitar will make a D chord on the ukulele. This would require you to place your fingers on the second fret of the G, C, and E strings of the ukulele, leaving the A open. The formulation for a D chord on a guitar is a great one for ukulele because it only uses the top three strings, allowing the ukulele to use each note. On the guitar, you place a finger on the second fret of the high E string, the third fret of the B string, and the second fret of the D string. You also strum the open D string along with the other three. This formulation is the same at the root of the ukulele neck. Transposing this up a fourth, it creates the G chord. This is one of the most essential chords for folk songs commonly played on guitar and uke. The E chord is a foundational chord for anyone who seeks to play the blues. The blues typically consists of E, A, and B chords. The E major chord requires a guitar player to place fingers on the second frets of the A and D strings, and a finger on the first fret of the G string. Every string on the guitar can be played to achieve this chord. Because the uke is more limited in strings, this chord shape only requires the use of two fingers. Placing a finger on the second fret of the G string and the first fret of the C string will create the chord shape needed. When this chord is strummed it can be played with all four strings. Transposing this chord up one fourth will get you to A. So, the chord shape for E on guitar will give you the A chord on ukulele. The B chord on the guitar is a fourth down from the E, so the chord shape for B on guitar is going to be the shape for E on the ukulele. The chord shape on guitar is more complicated than the others listed here, so we’ll only go over the ukulele shape. This chord is simple but will force you to use four fingers and all four strings. Place fingers on the fourth fret of the G, C, and E strings, and a finger on the second fret of the A string. If the finger on the A string is giving you trouble, you can always bar the second fret. The term “barring” refers to placing one finger flat all the way down across the fretboard. so, for example, if you were to bar the second fret you would lay your entire finger over the fretboard. If you were to strum, every note would be able to be heard. This is typically done with the pointer finger, and the remaining fingers are used to create chord shapes. This is an effective skill while you’re still trying to remember what all of the chords translate to on ukulele. All of the chord shapes that you remember on guitar will be the same chords if you bar your fretboard one fourth up. One fourth on the fretboard is going to be the first five frets. 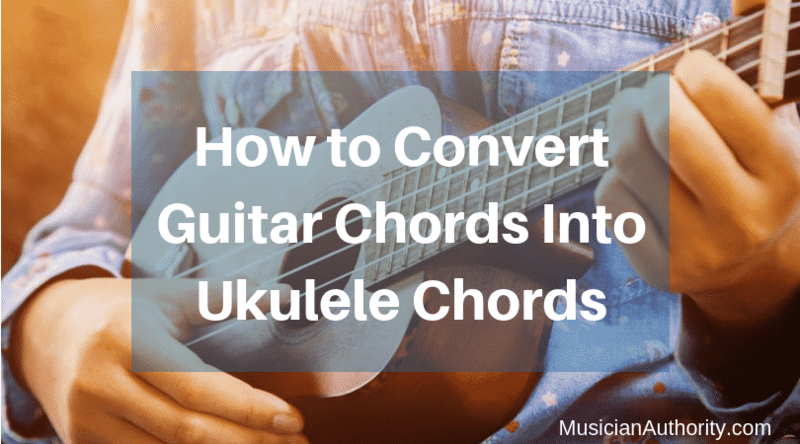 With this in mind, you can remember that if you were to bar the fifth fret, creating chord shapes with your remaining fingers, all of the chords shapes that you knew on guitar would give you the same chords on ukulele. A capo is a tool that essentially bars the fretboard for you. It clamps on to the fretboard and presses down on every fret so you don’t have to, allowing you to free up your pointer finger. While you’re beginning to get the hang of ukulele fingerings, you should try and put a capo on the fifth fret and mess around. This way you’ll be able to jam with your friends who are playing the guitar without having to do a bunch of calculations in your head. This is also a valuable thing to invest in if you are a singer or performer who wants to play live, a capo could come in really handy as well. If you need to play a gig relatively soon and you don’t have time to learn how to transpose the chords, get a capo on the fifth fret and all of your songs will be played with the same fingerings. The chords we covered in this article are only the most basic, commonly used chords. While you’ll be able to play a lot of the crowd pleasers relatively easily, you’re going to want to learn a little bit more. Go through all of the guitar chords that you already know and create the chord shapes from the top for strings onto the ukelele. Start out with a capo on the fifth fret and get a feel for how the formations work on the ukulele. Once you have the feeling down for the chords on the fifth fret, take the capo off and start playing them at the base. Mess around a little bit and see if you can figure which formations are which. If you have any trouble, look at the major scale. Go to the fifth fret, and count down four steps and see which note you fall on. That is going to be the note that the chord formation plays. You can also look at a chord chart online to see exactly what chord it is that you are playing. You could simply do this anyway, but understanding the notes you are playing and the theory behind them is essential if you plan to really expand your skills. Need Some Songs to Impress Your Friends? There are some songs that just beg to be played with ukulele chords. If the songs you know on guitar aren’t enough to satisfy your ukulele dreams, there are a lot of tutorials out there. If you need help learning any songs on the ukulele, we have everything you need.